When a homeowner needs a San Francisco copper repipe specialist they turn to the Gladiator repipe team. The pipes that are installed in residential and commercial properties are designed to last for many years, but eventually, the items begin to degrade. Whether you want to have your galvanized pipes replaced or you are looking for copper repipe in San Francisco, our team can help. Customers can contact our copper repipe plumbers at 408-444-2696, or stop by 190 N. Montgomery St. San Jose, CA 95110 to speak with a team member today! Galvanized were once the most popular pipes in the 1960’s, however, over the years galvanized pipes begin to rust, leak, and create health issues. If your home was built in the 1960’s your pipes are likely galvanized pipes or lead. If you home contain either lead or galvanized pipes you will want to have them replaced as soon as possible. Contact us today to schedule a San Francisco copper repipe and we’ll get rid of those old galvanized and lead pipes out of your home or business quickly. 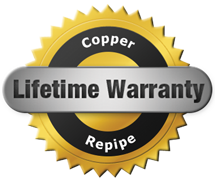 Rather than coping with degrading water pipes, it is better to call our copper repipe specialists in San Francisco for a total replacement. At Gladiator Repipe, we can complete galvanized pipe replacement in San Francisco at homes or businesses. Galvanized pipes in San Francisco are the most common types of pipes used in homes. For efficient San Francisco copper repipe services, customers can contact Gladiator Repipe to have a plumber inspect a building’s pipes. We can provide a written estimate that includes the cost of materials and labor along with a timetable concerning the job. Our San Francisco copper repipe plumbers make sure to install the connectors and pipes correctly so that property owners won’t have water leaks in only a few months.